Is it possible that studying prophecy can take our eyes off of Jesus? The word “prophecy” is from the Greek word “prophēteia” which means “a discourse emanating from divine inspiration and declaring the purposes of God,” so prophecy is not always speaking about the future but can be, as the verb form “prophēteuō” indicates, “speaking forth by divine inspirations” which can simply mean teaching God’s Word, so prophecy can sometimes mean “forth telling” or it can mean teaching Scripture. The context will tell us which it is. In our focus of prophecy, we look at prophecy as history written in advance, and prophecies in the Bible are as sure to come to pass as the sun will rise in the morning. Bible prophecy is not the only prophecies ever written in the world, but the difference between prophecies of man and prophecies recorded in the Bible is what the Apostle Peter says, “no prophecy was ever produced by the will of man, but men spoke from God as they were carried along by the Holy Spirit” (2nd Pet 1:21). A lot of mankind’s prophecies have come and gone and most of them have failed to be fulfilled as prophesied, but the prophecies in the Bible don’t depend on the effort of man, but upon God Who has the power to bring it about. We know for certain that “no prophecy of Scripture comes from someone’s own interpretation” (2nd Pet 1:20). If it does it will fail, but if it’s from the Word of God, nothing can prevent it from coming to pass. Zachariah, the father of John the Baptist, “was filled with the Holy Spirit and prophesied, saying, ‘Blessed be the Lord God of Israel, for he has visited and redeemed his people’” (Luke 1:67-68). Of course, this refers to Jesus Christ Whom John the Baptist would prepare the way for, which was also a prophecy fulfilled when an angel of the Lord said to Zachariah concerning John, “And he will turn many of the children of Israel to the Lord their God, and he will go before him in the spirit and power of Elijah, to turn the hearts of the fathers to the children, and the disobedient to the wisdom of the just, to make ready for the Lord a people prepared” (Luke 1:16-17). Many people today are fascinated by Bible prophecies, and their interests vary according to specific areas. Most of the top prophecies focus is on wars and rumors of wars, Gog and Magog, the mark of the beast, apostasy, Israel, Islam, the rapture, and the tribulation, but by studying these subjects, can we really change things? Do we know when they’ll happen? 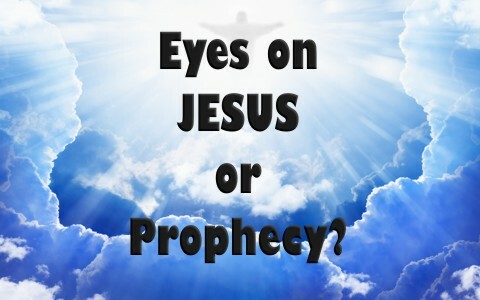 Some get so deep into studying prophecy that they take their eyes of Jesus and focus on the end times and not on the Son of God. Some spend their time looking for clues as to when the end of this present world comes, trying to unravel all the news of the world and trying to fit it all into Bible prophecy, but is this what Jesus taught us to do? Is our priority to seek understanding of prophecies or seek the kingdom first and foremost (Matt 6:33), meaning we seek the King of that kingdom first? There are hundreds of prophecy hounds who are trying to follow the scent of end-time events so that they might have special knowledge about it, but what happens is we start studying prophecy to the exclusion of Jesus’ focus on following Him and becoming one of His disciples.. When Jesus gave the Olivet Discourse or Olivet Prophecy, He was foretelling things to come and told His disciples what to watch for, but many of these things Jesus mentioned happened in their own lifetime so it wasn’t about things that will happen in the far flung future. Some of these prophecies were, like Jesus’ coming, but other things He mentioned in Matthew 24 did not come to pass in the disciples’ lifetime. Either way, I don’t think Jesus uses prophecy as a bookmark for his disciples and believers to use to “count down” the days until His return. There has always been an expectation that Jesus could come back at any moment. The 1st century church lived in expectation of Jesus’ return in their lifetime, but as we now know, it’s always been that way with almost every church age, and I think that’s the way God wants it. The problem is so many evangelists and self-proclaimed prophets are focusing so much on world events and prophecies being fulfilled, that they are like the Apostle Peter who took his eyes off of Jesus when walking on the water and began to sink. The same thing can happen to us if we become too preoccupied with prophecy to the detriment of studying Jesus’ teachings, which is what the early church focused on (Acts 2:42). Today, there are untold thousands whose primary mission isn’t making disciples, as Jesus told us to do (Matt 28:19-20), but instead they spend their time unraveling prophecies looking for just how close to the return of Christ we are. Jesus told them to “Go therefore and make disciples of all nations, baptizing them in the name of the Father and of the Son and of the Holy Spirit, teaching them to observe all that I have commanded you” (Matt 28:19-20). He never taught them to “focus on prophecy and figure out when I’m coming back.” He told them no one can know that time. I won’t name the hundreds of people who are fixated on prophecy because it would fill the entire webpage in doing so, and besides, I don’t think it would be helpful. When you see a preacher or TV evangelist only be concerned with the end times and how they fit into Bible prophecy, it’s a safe bet that they’re not teaching what Jesus taught His own disciples (found in the gospels), therefore, Jesus is left in the background and almost seems a distraction. If we are like the early church, we should prioritize what Jesus said we should do, and that is making disciples of all nations and getting the gospel to the whole world, however, far too many are fixated (some I would say are obsessed) on Bible prophecy that they inadvertently place the importance of prophecy over what Jesus tells us to do (i.e. Matt 25:34-40), and they do all their studies on prophecy instead of studying what it means to be a disciple of Christ and what Jesus meant when He said “Follow Me.” It’s almost as if Jesus gets in the way of their prophecy studies and so He is infrequently mentioned. I can’t count all of the people that have contacted me about “Who is the beast, what is the mark of the beast,” or “when is the tribulation.” That’s all they think about when we should be focusing on the kingdom above all things, and of course that means, we focus on the King of that kingdom, Jesus Christ. Thank you, Pastor Jack. This is like rushing around, doing all these “other things,” when He only wants us to do that “one thing,” which is sit at His feet and learn from him. Previous post: Who Were The Herodian’s?